The World in Our Eyes: A Native American Vision of Creation, celebrates the wisdom of America's indigenous people through myth and music. The music video features an artful combination of narration, traditional Native American dances, and southwestern landscapes set to the soundtrack of The World in Our Eyes: A Native American Vision of Creation (14040) conceived by J. Reuben Silverbird and Rob Russo. Together, these elements capture the essence of the ancient heritage. 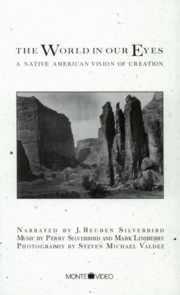 Although the Navajo, Zuni, Hopi, Apache, Cheyenne, and Pawnee nations are separated by geography and language, these and other tribes share many beliefs about the origin of the universe, which Silverbird has distilled into a powerful and poetic narration. Viewers will not only be transported back in time while listening to the Native American vision of creation, but will travel through desert and mountain scenery in such places as Window Rock and Canyon de Chelly, Arizona; Monument Valley, Utah; Cape Ecola, Oregon; Rapid City, South Dakota; and San Manuel, Texas. Filmed by Steven Michael Valdez, this trip through some of the southwest's most striking scenery is a visual education in the settings in which Native Americans have lived for millennia. Under the same bright sun and hard-packed earth documented in the video, Native Americans revered nature and their symbols of it, Sky Father and Earth Mother. In the first half of the video, Silverbird, weaves ageold ideas into a colorful tapestry of dramatic recitation, music, and natural sounds, guiding listeners on a journey from the primordial awakenings of the universe when Earth Maker first created the stars to man's discovery of his true nature. The second half of the video presents a compelling instrumental score without narration, providing a continuous musical meditation on the ideas expressed throughout the first half. The World in Our Eyes also features the haunting Native American flute performance of Perry Silverbird, as well as Sioux singers, and drummers from South Dakota. The sounds of the seasons were recorded by Mark Lineberry, who composed and performed the background music. J. Reuben Silverbird, a NavajoApache, is a distinguished spokesman for Native Americans. He is a board member of the American Indian College Fund and the American Indian Museum in New York, as well as President of the Annual American Indian Nations Powwow. He has lectured on American Indian topics throughout the country and has appeared on many television programs. During the time video photographer, Steven Michael Valdez, worked as a television news photographer for NBC stations in Tucson and Phoenix, he was inspired to create videos reflecting the rugged face of nature in Arizona. His first video for MonteVideo, The Petrified Forest (19001), captured the splendor of the prehistoric forest.